If a tire goes flat while driving, grasp the steering wheel firmly, and brake gradually to reduce speed. Then, stop in a safe place. Replace the flat tire with a compact spare tire. Go to a dealer as soon as possible to have the full size tire repaired or replaced. 1. Park the vehicle on firm, level, and non-slippery and apply the parking brake. 2. Move the shift lever in . 4. Turn on the hazard warning lights and set the power mode to VEHICLE OFF (LOCK). 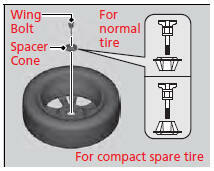 Periodically check the tire pressure of the compact spare. It should be set to the specified pressure. Specified Pressure: 60 psi (420 kPa, 4.2 kgf/cm2) When driving with the compact spare tire, keep the vehicle speed under 50 mph (80 km/h). Replace with a full size tire as soon as possible. The compact spare tire and wheel in your vehicle are specifically for this model. Do not use them with another vehicle. Do not use another type of compact spare tire or wheel with your vehicle. Do not mount tire chains on a compact spare tire. If a chain-mounted front tire goes flat, remove one of the full-size rear tires and replace it with the compact spare tire. 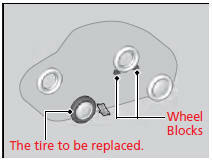 Remove the flat front tire and replace it with the full size tire that was removed from the rear. Mount the tire chains on the front tire. Do not use a puncture-repairing agent on a flat tire, as it can damage the tire pressure sensor. 2.Take the tool case out of the trunk. Take the jack and wheel nut wrench out of the tool case. 3. Unscrew the wing bolt, and remove the spacer cone. Then, remove the spare tire. 4. 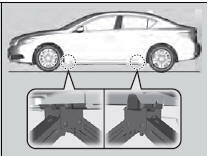 Place a wheel block or rock in front and rear of the wheel diagonal to the flat tire. The shape of the tool case varies by model. 5. 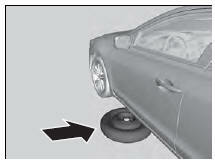 Place the compact spare tire (wheel side up) under the vehicle body, near the tire that needs to be replaced. 6. Loosen each wheel nut about one turn using the wheel nut wrench. 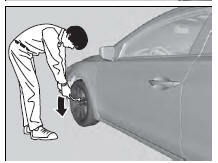 1.Place the jack under the jacking point closest to the tire to be changed. 2. 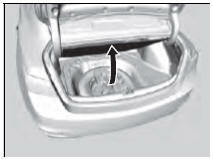 Turn the end bracket (as shown in the image) clockwise until the top of the jack contacts the jacking point. - Make sure that the jacking point tab is resting in the jack notch. 3. 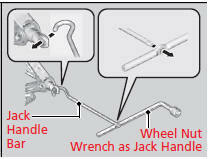 Raise the vehicle, using the jack handle bar and the jack handle, until the tire is off the ground. The vehicle can easily roll off the jack, seriously injuring anyone underneath. Follow the directions for changing a tire exactly, and never get under the vehicle when it is supported only by the jack. Do not use the jack with people or luggage in the vehicle. Use the jack provided in your vehicle. Other jacks may not support the weight (“load”) or their shape may not match. The following instructions must be followed to use the jack safely. • Do not use while the engine is running. • Use only where the ground is firm and level. • Use only at the jacking points. • Do not get in the vehicle while using the jack. • Do not put anything on top of or underneath the jack. 1. Remove the wheel nuts and flat tire. 2. Wipe the mounting surfaces of the wheel with a clean cloth. 3. Mount the compact spare tire. 4. Screw the wheel nuts until they touch the lips around the mounting holes, and stop rotating. 5. Lower the vehicle and remove the jack. Tighten the wheel nuts in the order indicated in the image. Go around, tightening the nuts, two to three times in this order. 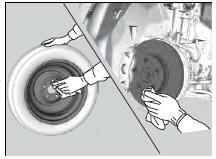 Do not over tighten the wheel nuts by applying extra torque using your foot or a pipe. 2. Place the flat tire face down in the spare tire well. 3. Remove the spacer cone from the wing bolt, flip it over, and insert it back on the bolt. 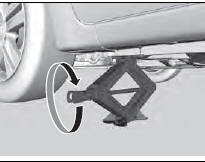 Secure the flat tire with the wing bolt. 4. Securely put the jack and wheel nut wrench back in the tool case. Store the case in the trunk. Loose items can fly around the interior in a crash and can seriously injure the occupants. 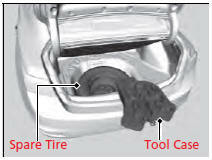 Store the wheel, jack, and tools securely before driving. 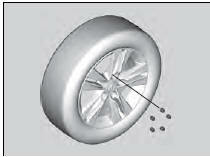 If you replace a flat tire with the spare tire, the low tire pressure/TPMS indicator comes on while you are driving. After driving for a few miles (kilometers), the indicator will start blinking for a short time and then stay on. CHECK TPMS SYSTEM appears on the multi-information display, but this is normal. If you replace the tire with a specified regular tire, the warning message on the multi-information display and the low tire pressure/TPMS indicator will go off after a few miles (kilometers). The system cannot monitor the pressure of the spare tire. 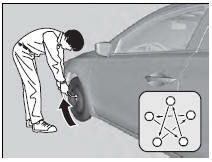 Manually check the spare tire pressure to be sure that it is correct. Use TPMS specific wheels. Each is equipped with a tire pressure sensor mounted inside the tire behind the valve stem.